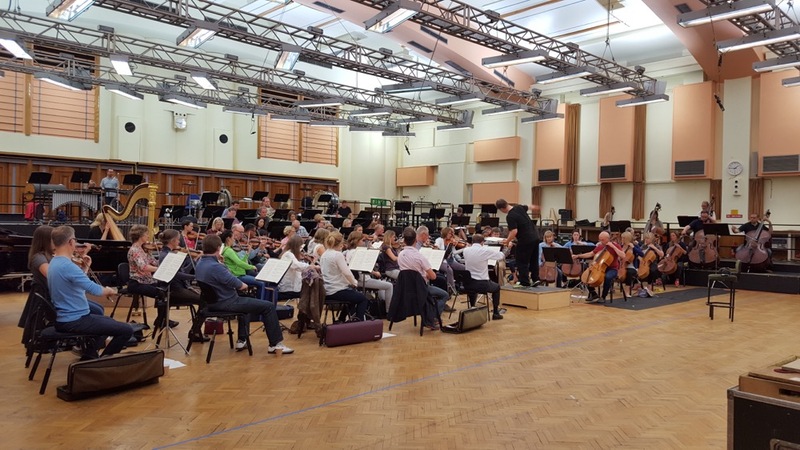 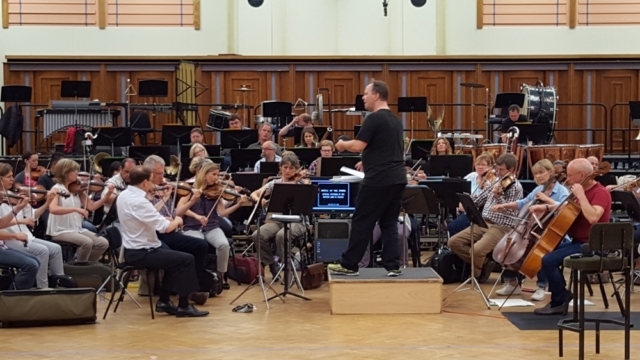 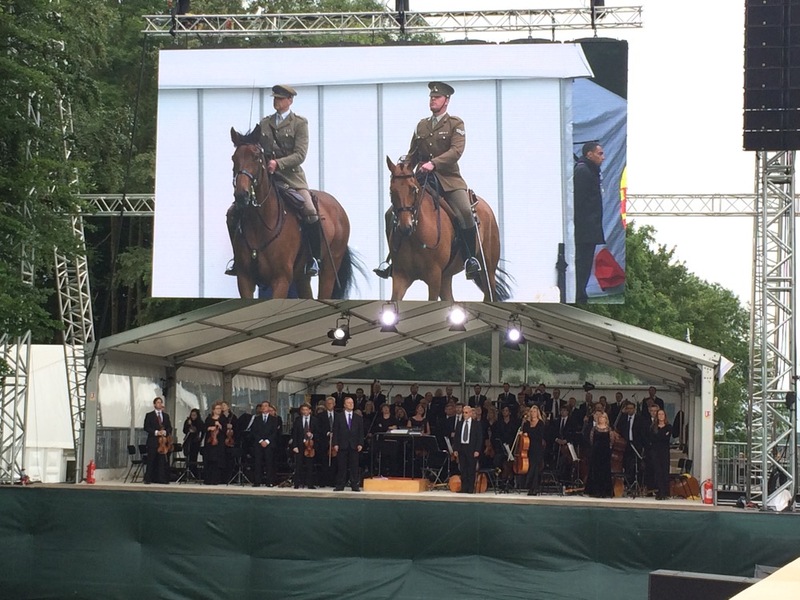 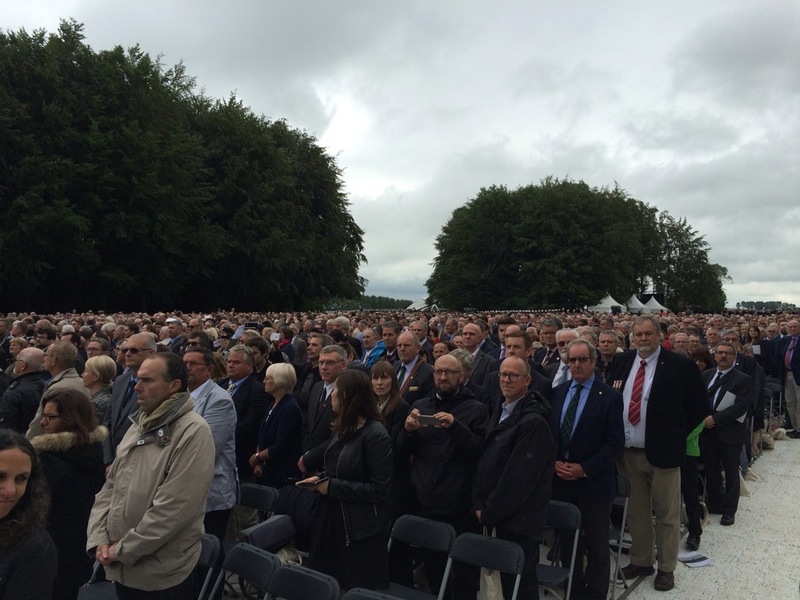 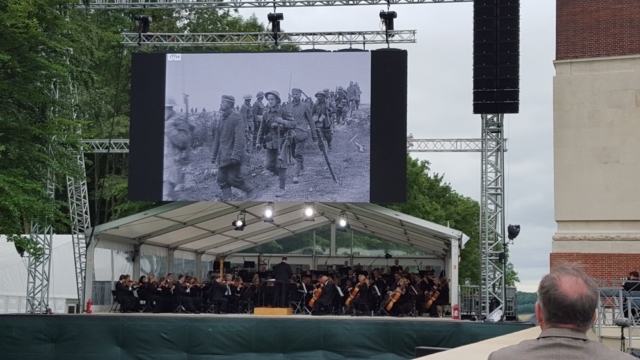 The project commenced on 1 July 2016, with Sakari Oramo conducting the BBC Symphony Orchestra in a live performance of Laura Rossi’s score to The Battle of the Somme film, as part of the national commemorative event at Thiepval Memorial, France. 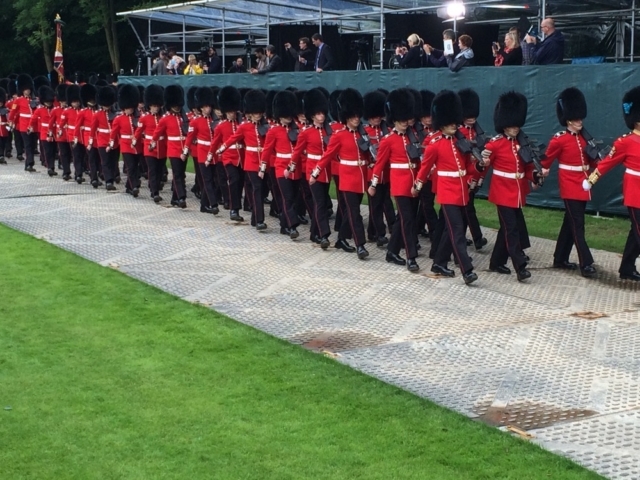 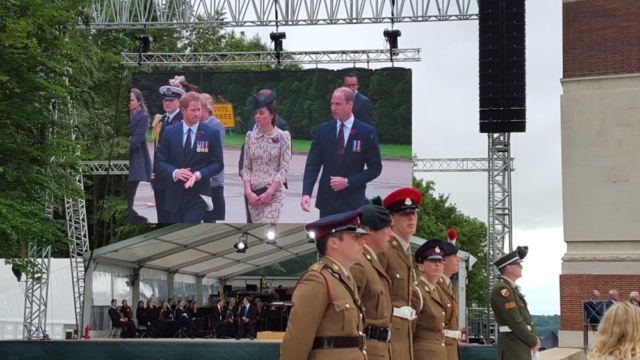 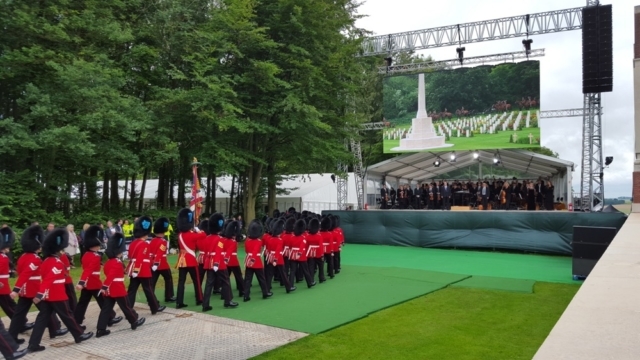 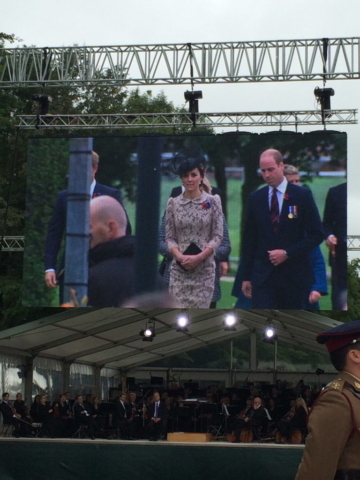 Broadcast live on BBC TV, the event was attended by world leaders, members of the British Royal Family, servicemen and the 8000 members of the public. Live orchestral screenings took place the same day with performances in London, Manchester, Berkhamsted and Southend-on-Sea. Experiencing the BBC Symphony Orchestra accompanying extracts of the film at Thiepval as part of the commemoration events on July 1st was intensely moving. 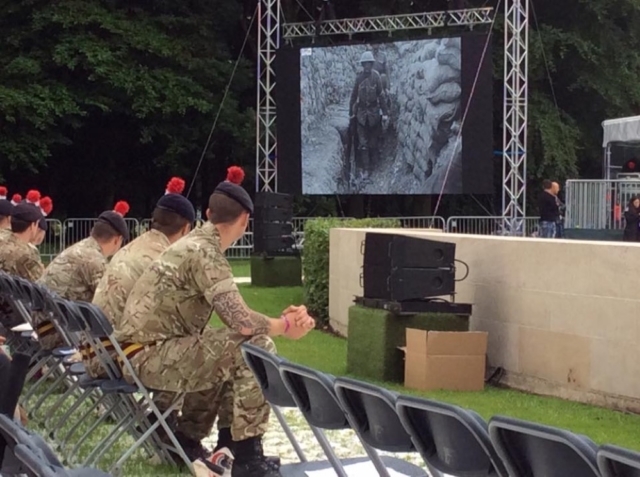 It was scheduled just prior to the ‘official’ ceremony itself so at first it was really distracting to keep seeing lines of soldiers filing through the general audience to take up their seats towards the front. But then the juxtaposition of their processing and the marching soldiers on the screen hit hard, parallel faces in the same place and in many ways so similar, yet separated not only in time but by so much acquired knowledge of the realities of warfare. 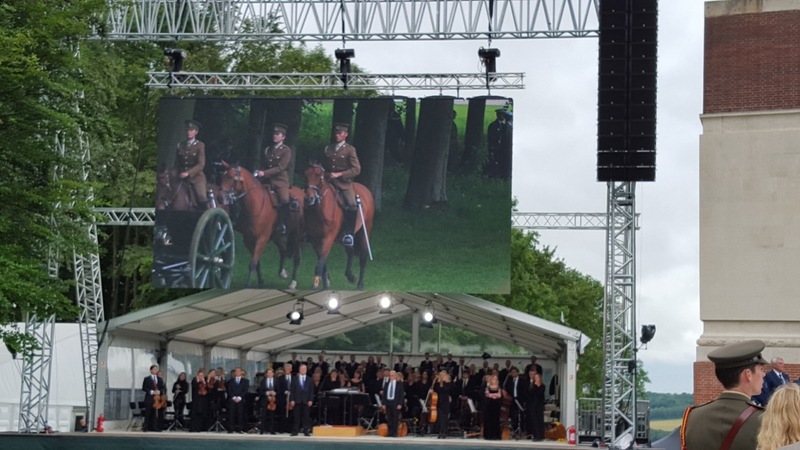 As the orchestra finished we turned round to survey the audience – in their thousands – sitting mostly behind us and rapt with attention and solemn wonder at what they had just seen. 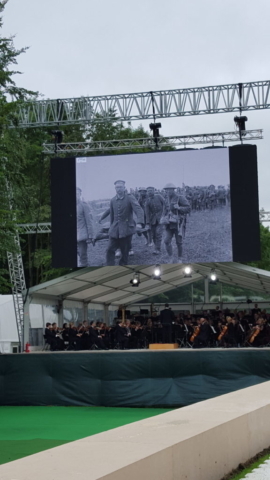 Like probably many many other days at Thiepval it felt like we were on sacred ground, intensified on this day by ceremonial rite: an unforgettable and privileged start to the year-long project of live screenings! 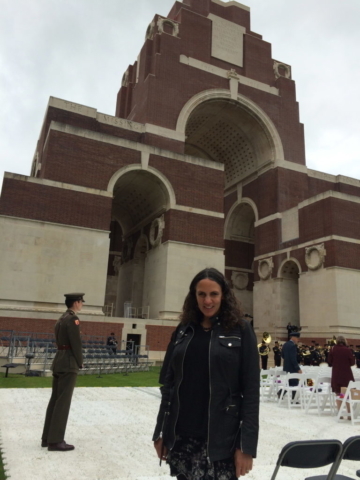 Neill Quinton and I had a crazy day trip over from London. The previous evening I attended the Imperial War Museums event “The Night Before the Somme” speaking on a panel with 3 historians for a discussion chaired by Kate Adie (proceeding a screening of the Somme film with my recorded score). 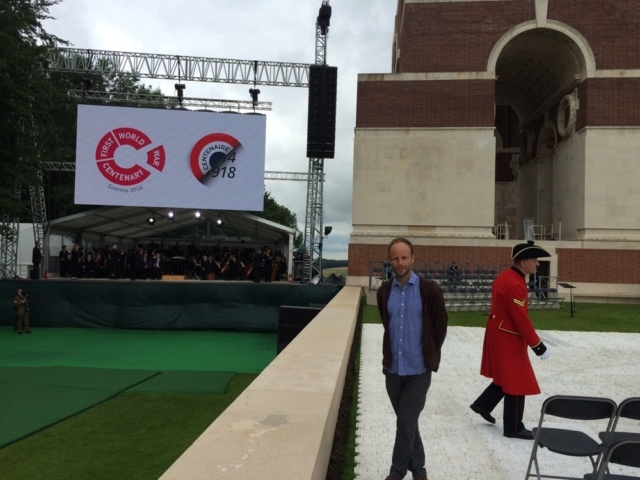 I rushed off after the screening to meet Neill on route to get to the Eurotunnel. We arrived in time but there was a huge queue of people and we had to wait for hours and tried to sleep in the car. Finally at 4am we boarded the train and set across the ocean. 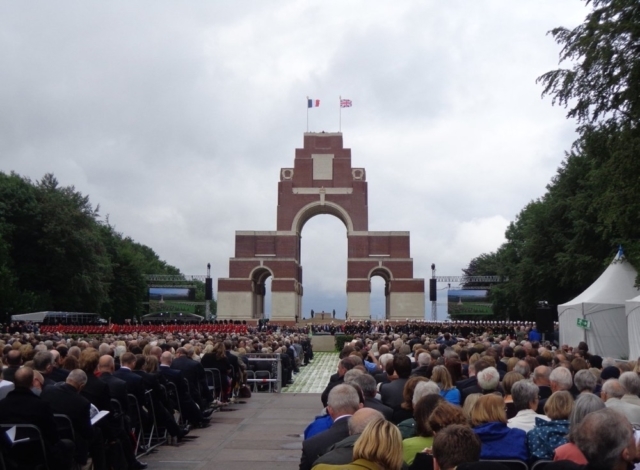 When we arrived the other side we had just enough time to get to Thiepval. 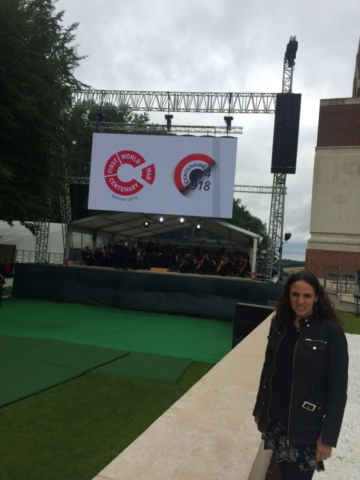 I had to do a live radio interview for BBC London whilst whizzing round the first roundabout and at the same time trying to direct Neill on which way to drive, as we were so late we had no time to stop! 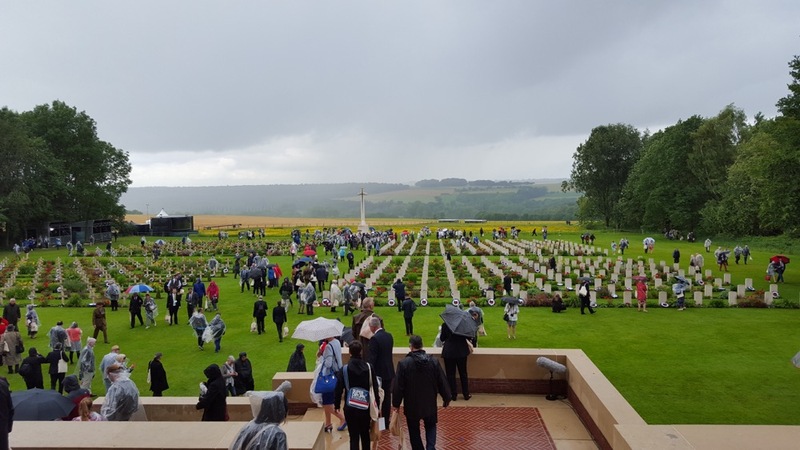 We finally arrived at Thiepval after getting very lost (as the road signs were all covered up and instead had people pointing to which way to go!) 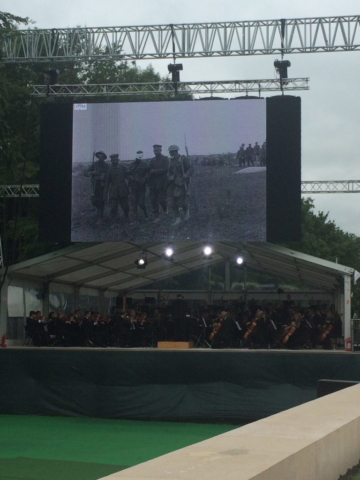 We were directed to a place to stand near the front by the BBC Symphony Orchestra. 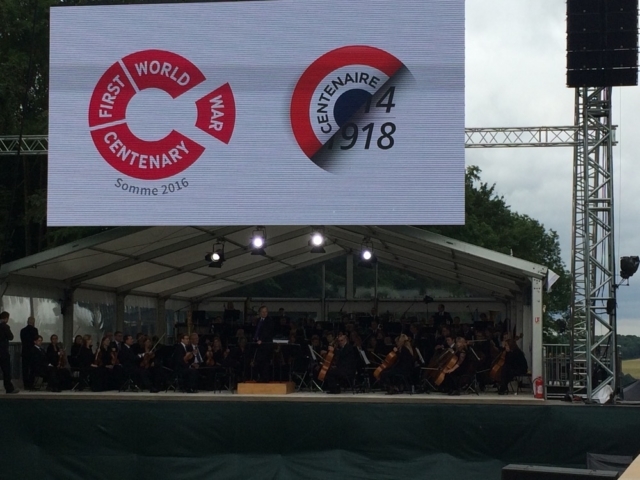 The orchestra conducted by Sakari Oramo played brilliantly. 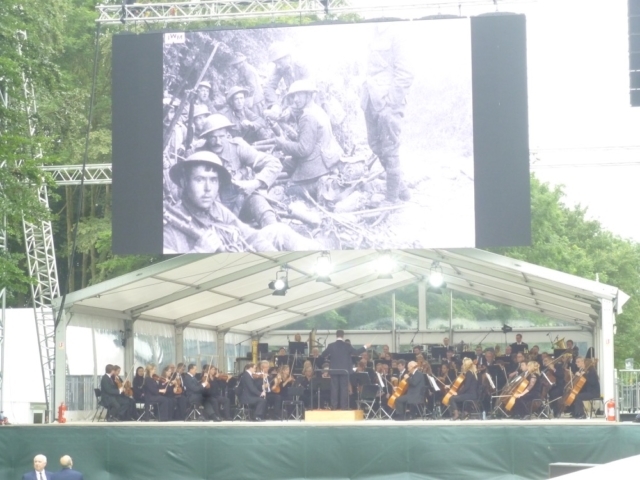 The film was presented on 2 large screens either side of Thiepval memorial to an audience of 8000 before the service began. 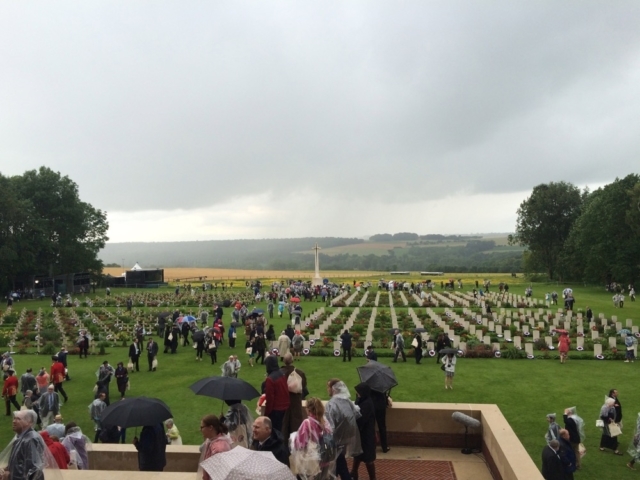 Standing there in the rain on the Somme battlefields, by the huge tombstone of soldiers missing in action with no known grave, was an incredibly moving experience. I have watched this film hundreds of times and I feel like I know the men in it, so watching them up there on a large screen in the exact place where this happened 100 years ago was very powerful.